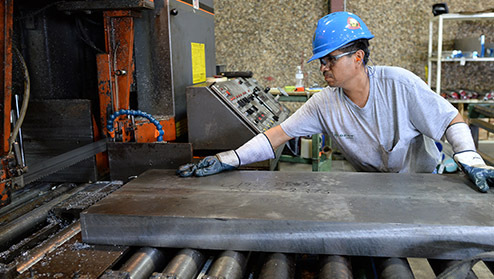 The Trident Company offers many value-added offerings in the way of in-house machining and precision processing of non-ferrous alloys. 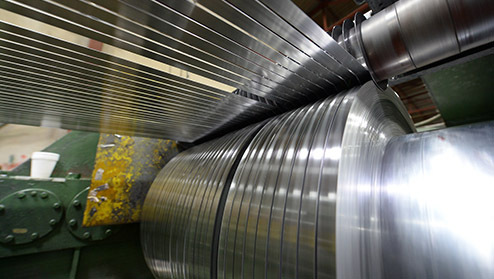 The Trident Company’s Coil Processing Department has one (1) leveling line, two (2) slitters, and one (1) transverse winder capable of processing various widths, lengths and thicknesses. Whatever your need for custom fabrication, Trident has a way to meet that need and exceed your expectations. Please contact our Machining Specialist to inquire on any special needs such as Centerless Grinding and precision Gun Drilling. 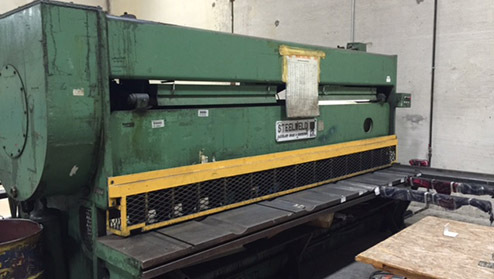 Rowe Leveling Line with Herr-Voss Shear: .032” to .160” smooth aluminum and tread plate up to .125” thick. 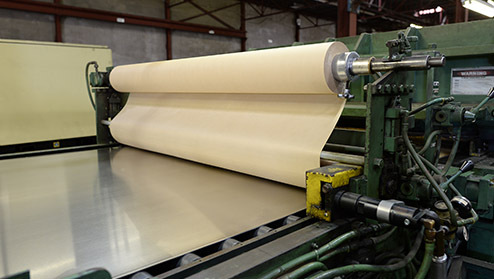 We have the ability to level epoxy coated steel and painted aluminum, as well as PVC both sides of a sheet while processing if needed. Steelweld Shear: We have the ability to cut straight lines on flat Aluminum or CR Steel metal stock. Ruesch Small Slitter: Various thicknesses with width ranging from 1” to 13” from 14” wide 2,500# master coil. Copper and Brass only. Slit Width: 1” Minimum and 13” Maximum with 8” Minimum to 12” Maximum I.D. 24” Master Coils: Slit .500”, .562”, .568”, .578”, .603”, .637”, .687”, .690”, .699”, .710”, .742”, .762”, .772”, and .782” with solid set of knives. 10” Master Coils: Ability to shim and slit other sizes but .500” is the minimum. Ideal Traverse Winder: A machine that will spool coil that has been slit and traverse wind the material back onto a spool. Our capabilities are: Traverse winding and welding150# pancake coils into 850# spools in 1100-O and 5005-O only. Honing is an internal grinding process that produces a uniform size and fine finish as required in hollow parts. 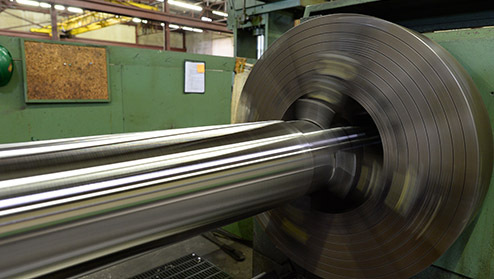 Trident’s horizontal honing machines can hone bores from 1.250” to 9.100” inside diameter up to 40 feet in length with finishes from 32 RMS thru as honed finishes. Small Deep Hole Drilling: A machining process that produces holes up to one hundred times diameter in depth. This would include gun drilling and solid boring. Deep hole drilling may be ordered in hole sizes from .500” to 1.000” inside diameter. Trepanning: A drilling process that leaves a core. Holes sizes from 4.5” to 8.5”. 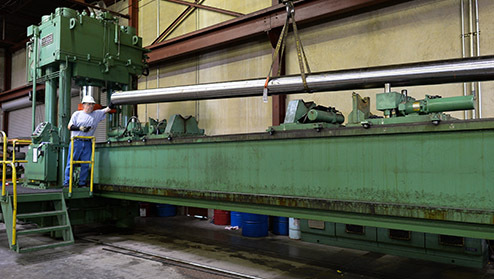 The process of reducing the outside diameter of a bar or tube. 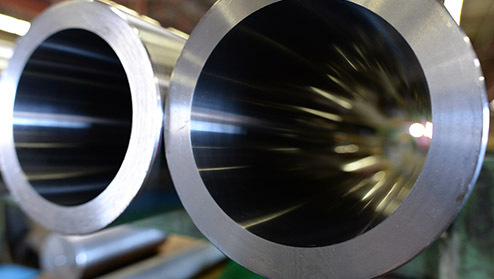 We offer rough turning and finish turning holding concentricity between inside and outside diameters. We are capable of turning anything we can bore. 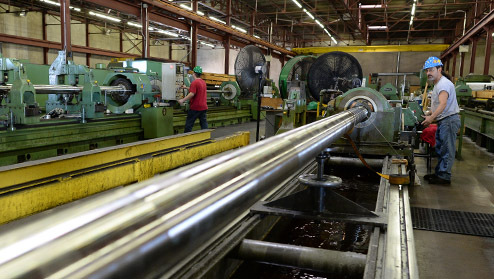 The Trident Company has the ability to straighten bar stock or tubing material that is bent, warped, or kinked.